One of the best food and wine experiences you could undertake would be the “Sommelier Experience” at Cloudy Bay Winery, which includes a private lunch in The Treehouse at Cloudy Bay, a luncheon menu created by talented chef Alain “The Swiss Guy” Hawswirth, and a tasting of award-winning wines selected and introduced by the winery’s in-house sommelier. Sounds like fun, right? Well, there’s one complication: You’ll need airfare to New Zealand, since Cloudy Bay is located in the heart of that country’s renowned Marlborough wine region. Or, you could just pop in to one of our local wine stores and pick up bottles of Cloudy Bay wine for yourself and do your own tasting. You can currently find Sauvignon Blanc, Chardonnay and Pinot Noir from Cloudy Bay here, and all are worthy of your consideration. Cloudy Bay also makes a sparkling wine called Pelorus, late-harvest Riesling and limited-release whites: Pinot Gris, Riesling and Gewurztraminer. The Pinot Gris, in my opinion, is especially worth hunting down. The name Cloudy Bay was bestowed by Captain Cook on a voyage to New Zealand in 1770, although Cloudy Bay Winery wouldn’t be established until 1985. In a very short period of time, Cloudy Bay Winery became virtually synonymous with Sauvignon Blanc and easily its most sought-after producer. Considering that many wine retailers around the world are on waiting lists to sell Cloudy Bay, we’re awfully lucky that the stuff is well-stocked in some of our state liquor and wine stores. It was Cloudy Bay that propelled New Zealand Sauvignon Blanc into the world’s wine consciousness. And over a relatively short span, it has become the prototype for Southern Hemisphere Sauvignon Blanc. It was primarily Cloudy Bay winemakers who introduced wine drinkers worldwide to the fruit-forward, aromatic, New Zealand style of Sauvignon Blanc, in contrast to France’s higher-acid and more austere Pouilly-Fumé and Sancerre from the Loire Valley. If you’re shopping for Cloudy Bay in Utah, pay attention to the vintage on the label. For some reason, stores are still carrying the 2006 Chardonnay, 2009 Sauvignon Blanc and 2007 Pinot Noir, even though newer vintages of each exist. I recently tasted the 2011 Sauvignon Blanc and the 2009 (available here), and found the older vintage to be losing a bit of fruit. 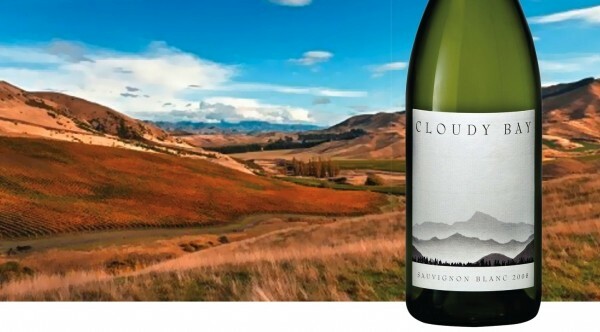 Cloudy Bay Sauvignon Blanc ($25.99) was recently awarded 91 points and listed as a Smart Buy in Wine Spectator, and was given a 90-point rating by Wine Advocate. The wine, which is fermented in stainless-steel tanks, carries bold tropical-fruit flavors of guava, lime and mango, along with iconic Cloudy Bay flavors: passion fruit, gooseberry, grapefruit, ginger and hints of lemongrass, with a slightly herbal finish. There’s creaminess here, too, possibly from a dash of Sémillon? The wine’s high acidity makes it a friend of a wide range of foods, but it’s an especially good partner for goat cheese, fresh-shucked oysters and a range of shellfish. I think it’s terrific with seared scallops. Cloudy Bay Chardonnay ($26.88) is a somewhat oaky and smoky affair, a rich, hefty Chard that is barrel-aged for a year in oak before bottling. Again, I’m not sure why the 2006 vintage is still on the wine racks here, since the 2008 is available, but at least it gives an idea of how the wine will age: not too well. Wait until the current vintage arrives. Cloudy Bay Pinot Noir ($38.32) has a smoky, charred character—a dense, spicy, fairly high-alcohol (14.1 percent) wine with enough backbone to face off even with meaty stews or cassoulet. It’s no wimpy Pinot.